The King made a second successful visit to Shoreham Camp. On this occasion he inspected the physical exercises and treatments for those recuperating at the Camp from injury – such as bouts of boxing. He also visited the gardens where recuperating soldiers grew vegetables – 200 tons of potatoes in the last year! During his inspection the large detachment of South African troops then at the Camp greeted the King with a wild ‘war whoop’. The King also took time to present the Military Medal to Corporal Balls with an audience that included locally employed German prisoners. He completed his visit to the coast with a trip to the Eastern Command Depot. 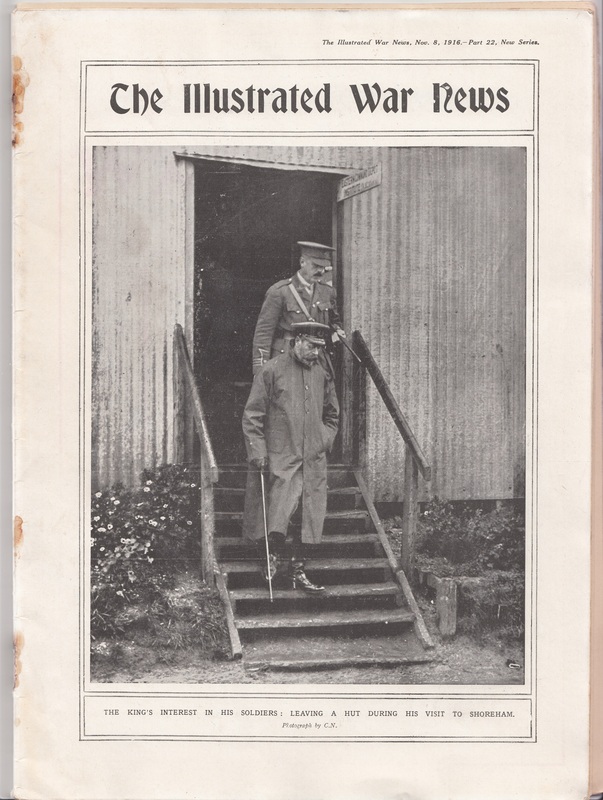 The King on his first visit to Shoreham Camp in 1916. The Illustrated War News, November 8th 1916 – part 22. Previous PostOn This Day 1917: Two youths from Shoreham Camp steal tricycle from shed of a Worthing residentNext PostOn This Day 1916: More Rink hockey at the dome!